Event planners need to consider what performance facilities are needed, whether indoors or outdoors, or even if it is temporary. Stages are usually elevated to provide the audience with a better view, especially for those spectators that are farther back. This elevation is itself a barrier to those who would rush the stage in an attempt to touch a performer. Per ADA requirements (Section 206) there are NO exceptions to the stage being accessible, which could be by a ramp or a lift. If the stage is only 6” tall, the ramp required would be a minimum of 6’ long. 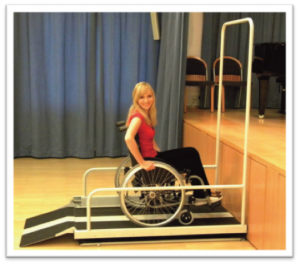 Stages can be accessed by a portable ramp, kept on site, that could be put in place when needed, but typically this is only done for stages under 12” tall. If the stage is 36” high, the ramp required would be 36’ long, usually with a switch back and landing configuration, and with compliant handrails. Wheelchair lifts are available for stages if there is no room for a ramp to be built. These lifts are safe, attractive and quiet and feature full, rigid safety skirting and a sleek, low profile. They can be portable and stored out of the way when not needed. Having your venue compliant with the ADA will only increase the overall amount of attendance. This equals more sales and it also shows you want your event accessible to everyone. Remember, typically for every person using a wheelchair, they bring at least 1 or 2 people with them to the event, sometimes even more! And if you promote your event on the website and in flyers that it is ADA compliant, you will reach a whole new audience that would have never thought to come before. The need for direct access to stages has been long in coming. Important life events like graduation; awards ceremonies and the like require direct access to the stage. Audience participation where people are asked to the stage for comedy or magic shows should not have a barrier of stairs. And there are quite a number of entertainers who use wheelchairs who are unable to perform on inaccessible stages. These examples illustrate the very real experiences of many. Routine and important life events are held in assembly areas where access to the performance area is an integral part of the ceremony. If the performance area is not directly connected to the wheelchair seating area, it may even be impossible for a wheelchair user to access the stage even if it was accessible. So this is an exciting time for us as we embark on a joint fundraising/education effort to make a local performing arts center, The Kenworthy Theater, accessible. They are in need of a stage lift and closed captioning system. By working together we will raise funds to make this community asset available to all!